The mighty Skogafoss waterfall was where I started my day. The wind was so strong that all the photographers were having a tough time taking pictures as their lenses were covered by mist. There were a few words flying high in front of the fall. A series of steel steps led to the top of the waterfall and it was a sight to behold. The river coming at the slowest pace and then taking a sheer vertical plunge of 30 metres or more and impacting the ground in all its might. 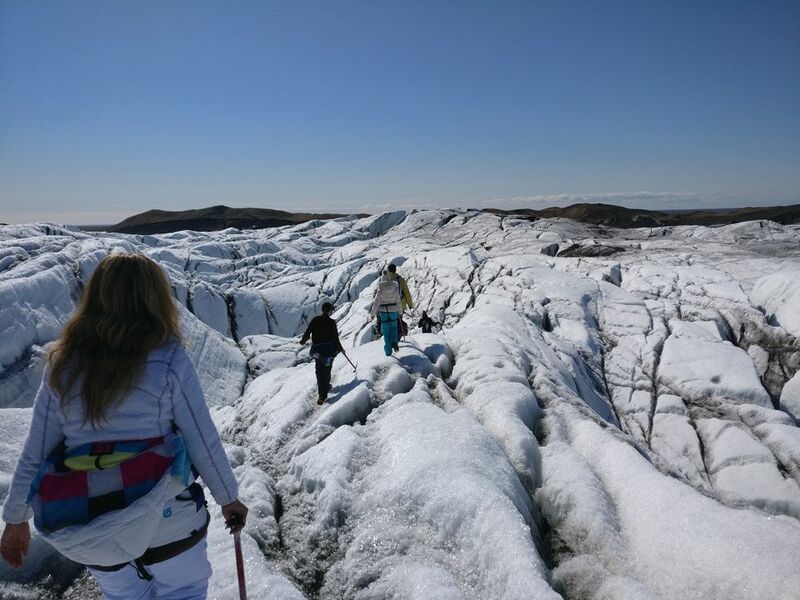 I wanted to do a glacier hike and reached the site of Icelandic Mountain guides but unfortunately they were sold for the day. Driving through moss covered fields on both sides of the incredibly treacherous road did not make for such a pleasant experience because my chances of the glacier hike were jeopardised. I decided to check out one of the most highly coveted tourist spots in Iceland - the Solheimasandur plane crash site. One needs to park their car by the side of the road and walk for 4 kms to reach the crash site which takes about 45 mins with normal walking speed. The sight is something unique since one walks on black sand and suddenly there is a skeleton of a crashed plane from WW-II. Pretty surreal! The day i was there was terribly windy and i had a hard time even to stand still. 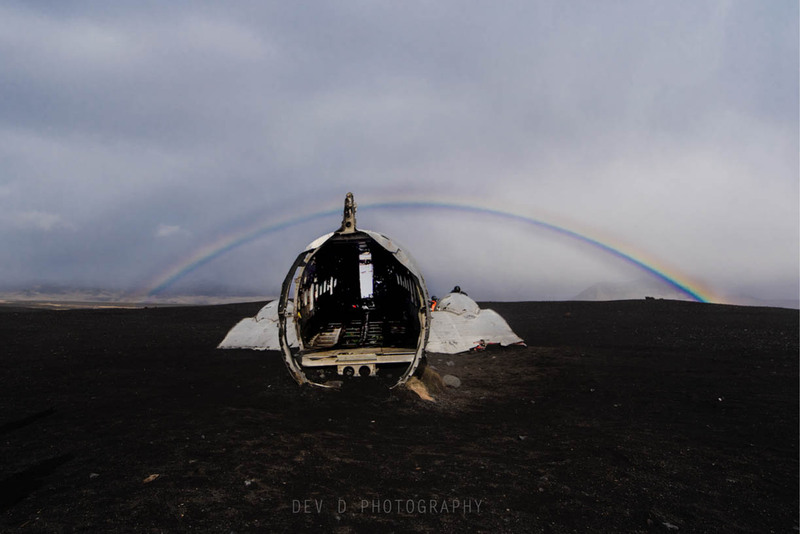 Lucky for me, i got a photograph of the plane with a rainbow in the background! After having a quick lunch of Skyr and muesli, i headed to Dyrholaey arch in the afternoon. The ride up the slope is not an easy one and takes some skill. A 4WD definitely helps in this regard! 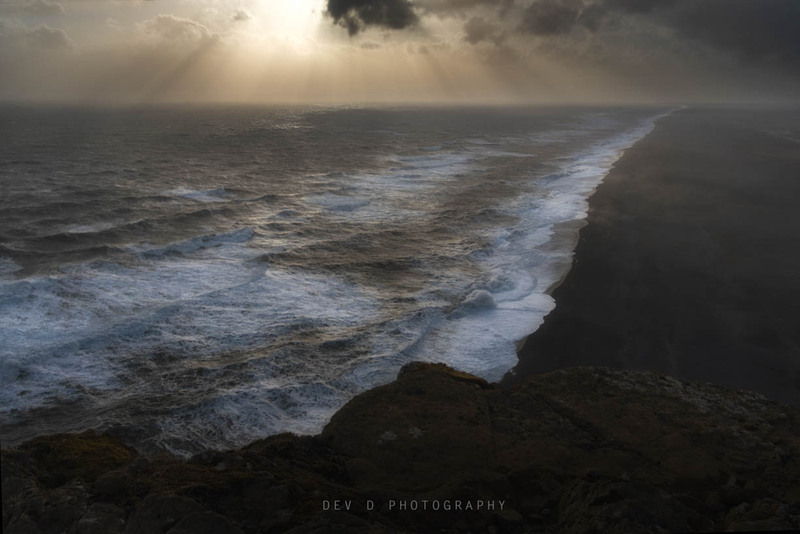 The wind conditions atop Dyrholaey were absolutely terrifying and i had a narrow escape from the heights of death since i was literally thrown over the cliff by a strong gust of wind. This is where I survived a close shave of death! The car was bombarded with small pebbles and i had to park my car at a lower elevation. There was absolutely no chance of taking any pictures, but still i managed to get a few of the famous arch. I realised that the bad weather conditions are going to persist and its best to make a move and go to the next location - the small town of Vik. I reached Vik in the late hours of the evening and found a nice resting spot for the night to sleep in my car. 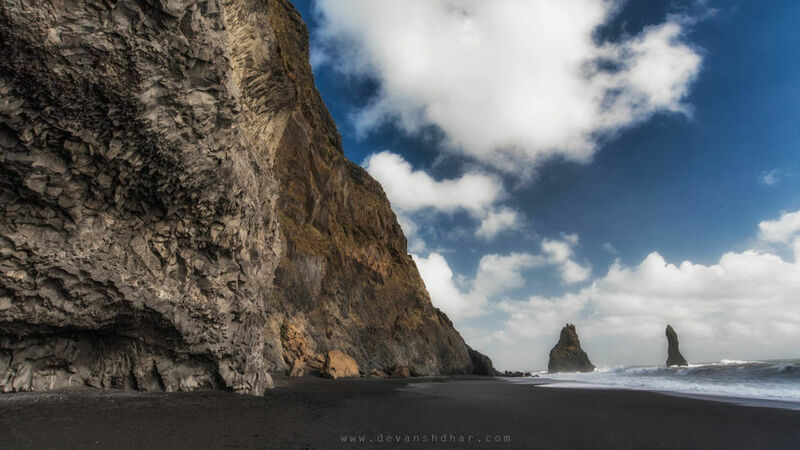 After a dip in the hot tub and a sauna in the local pool, i headed to Reynisfjara black sand beach from Vik. My jacket pockets were filled with black sand and my tripod was almost thrown into the sea due to the extremely windy conditions on that day. People had to stand at a precarious bent angle to avoid from being smacked face down into the sand. But nonetheless, it was a sight to behold. That was the first time in my life i saw black sand. The waves crashing on to the shore were very different from what we see in the traditional sand beaches. Pure beauty of nature! 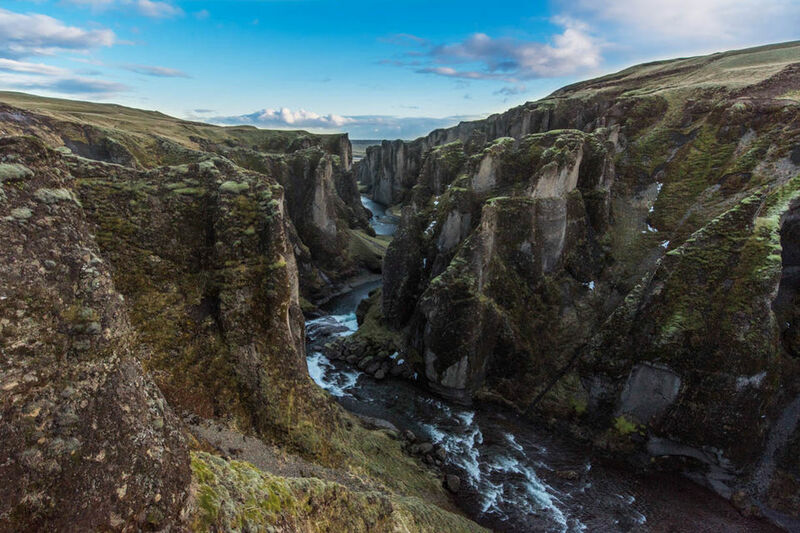 Later in the day i headed to Fjadargljufur - the only canyon in Iceland. It can be easily reached with a car and the hike up the to the top is scenic and all the more pleasurable under the afternoon sun. As they say, the weather in Iceland changes really frequently, I found myself in a mild snowfall just after an hour of bright sunlight! I retired for the night at the parking lot at Skaftafell. The day started with a glacier walk at Skaftafell. It was an incredible adrenaline rush walking with the crampons on the glaciers with volcanic ash engrained in them with the path being dangerous too at some locations. Our guide did a wonderful job in explaining to us the history of formation of the glaciers and how to judge the thickness of the glaciers at places. After a quick lunch, I headed to Jouklsarlon, one of the best places to watch glaciers in Iceland. 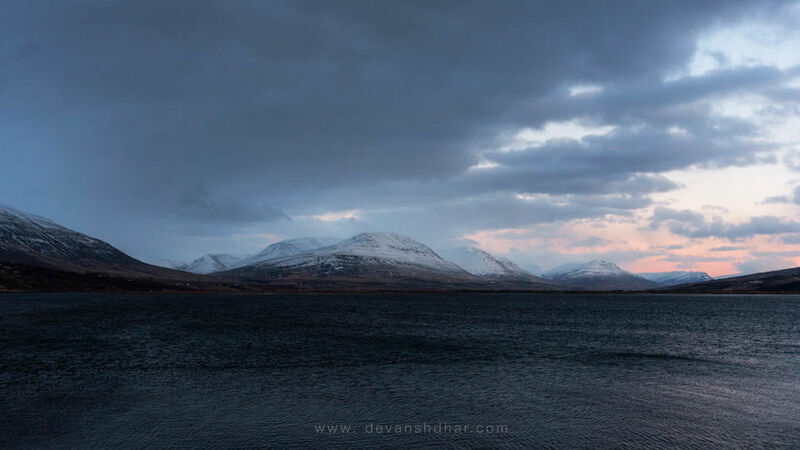 I was there in time for sunset and without an iota of doubt, it was one of the best sunsets I have a memory of ! What many travellers miss here is the Diamond beach which is located just on the opposite side of the road. 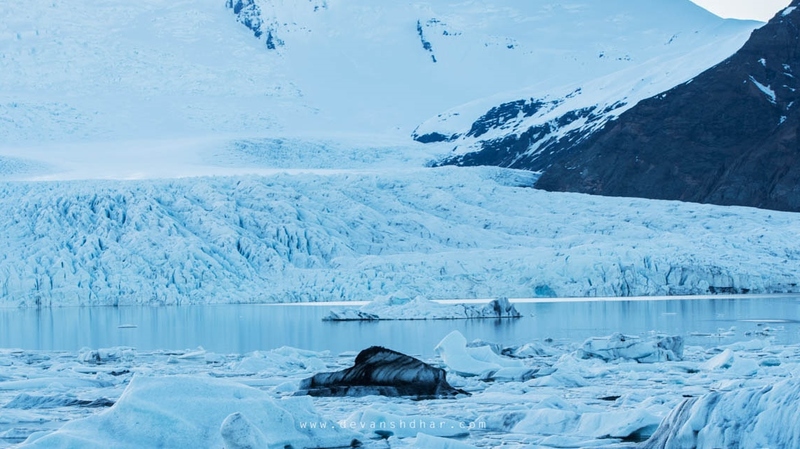 The speciality of this beach are the completely transparent pieces of ice broken off from the icebergs which line up the black sand in a long stretch! A scene straight out of a fairytale novel. On my way to Hofn, I picked up a hitchhiker from Canada who was a musician. I had a hearty chat after a long time with her and got to know about her German roots. We reached Hofn HI Hostel where the night was spent drinking beers and whiskey and making some new friends. 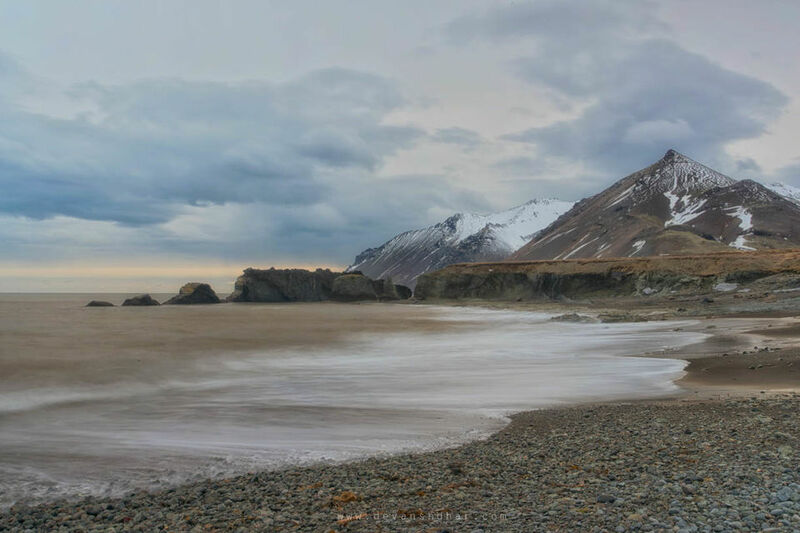 Now i was headed to the East of Iceland and I drove to Leakjavik beach to get some nice landscape shots under the overcast skies. The drive was a scenic one as usual and i had a wonderful time to myself stopping at random locations, having a lunch wherever i wanted to and spending all the time contemplating on the importance of this trip for myself while admiring the scenic beauty of Iceland. I reached the Hafaldan HI hostel at Seydisfjordor in the late hours. In all probability, it is one of the most picturesque buildings in Iceland with grandé interior decór and plush furnishings. The kitchen is an absolute delight ! 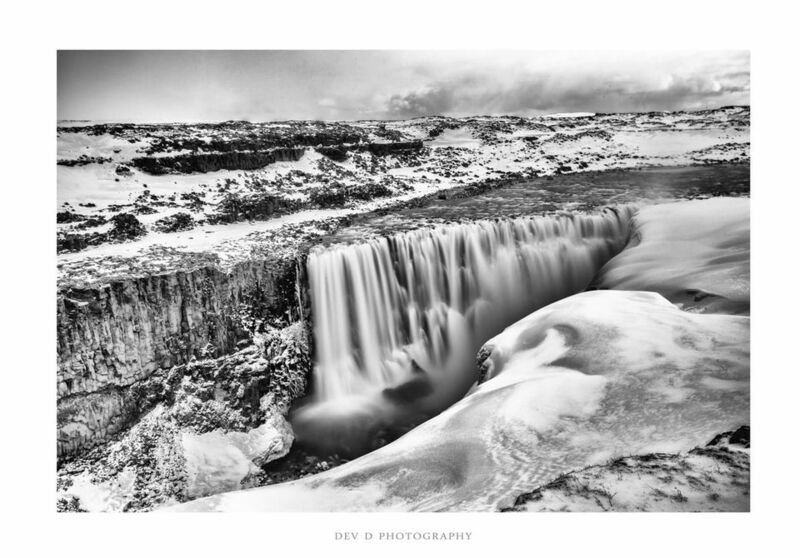 It was snowing heavily the next morning and I was headed to Dettifoss waterfall. The driving conditions were absolutely terrifying with severe winds and nearly horizontal snowfall making it an absolute nightmare to drive nearly a 100 kms in those conditions. I managed to reach the waterfall but had to hike through a kilometre of deep snow to reach the view point. The scene was laid out in grey in front of my eyes. The photo below from that day is a testimony of the fact! I also visited Selfoss waterfall but could not reach close to it because the approach road was still closed owing to bad weather conditions. For the first time in my life i saw a waterfall literally flowing upward because the winds were so strong that it was carrying the falling water up ! I got caught up in an unexpected snowfall and had to hike my way through a very bad condition to reach my car. Ahh, the joys of travelling ! Later in the day I visited Krafla power plant and Hverir. Boiling water gifted from nature and orange mud all around made quite an interesting composition at that place. Of course the fart smells of sulphur were a bit unpleasant, but one soon acclimatises with it. My next stop was the mighty Godafoss waterfall. Fortunately for me, the skies were clear and I finally got a chance to try my long exposure photography for this waterfall underneath the floating clouds. 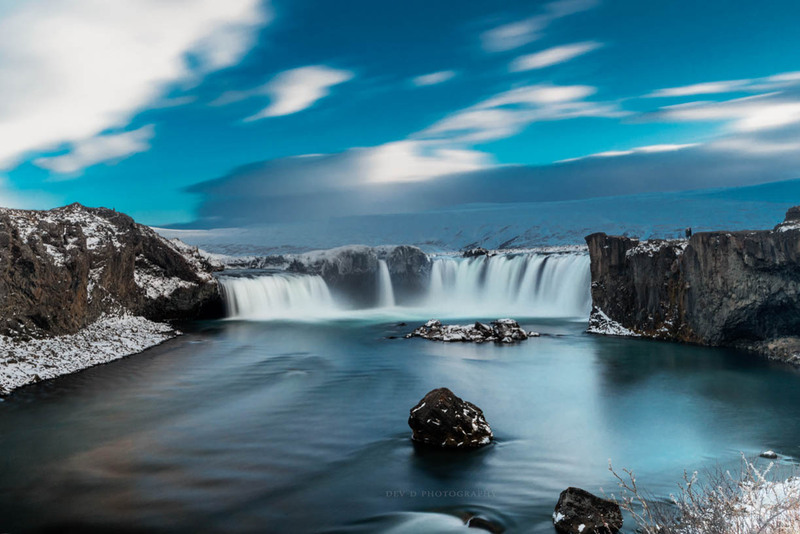 The size of this waterfall in one word is mammoth! It can literally gulp a semi-truck without even burping! I headed to Akureyri for the night and spent the night at Akureyri backpackers. Met a very friendly German who insisted that we go out later at night for viewing some Aurora activity and boy he was right! 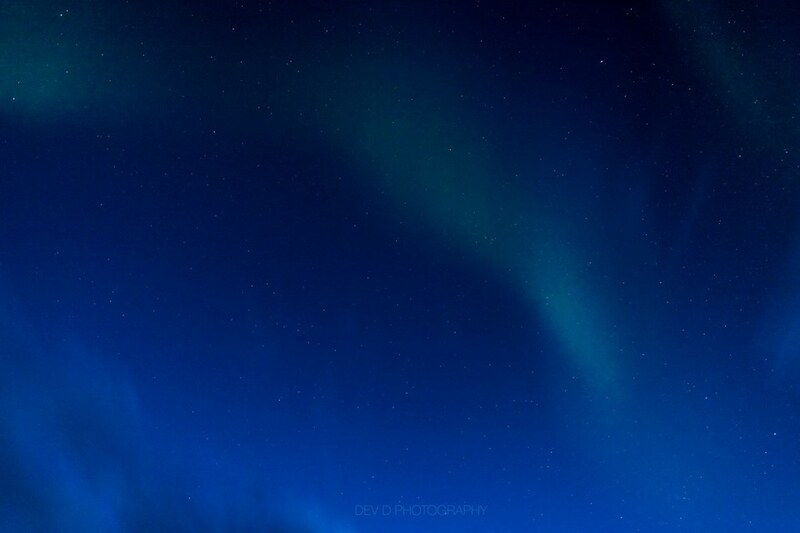 For the first time in my life i got to view the Auroras in all their might. Although the activity wasn't that spectacular but still it made me go in a trance seeing those dancing lights. The next day I headed to Glaumbaer which is famous for its cute turf houses. 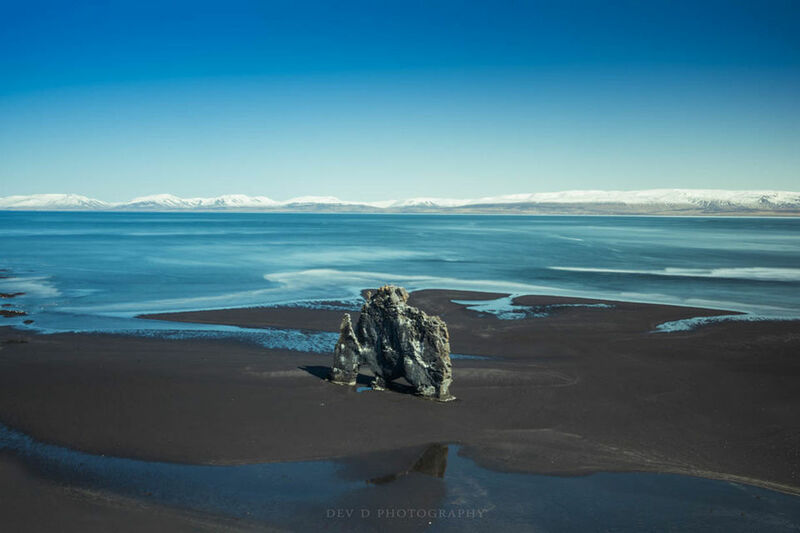 After taking a few nice photos I headed to Hvitserkur, the elephant shaped rock formation in the sea. The drive was a bumpy one with potholed roads but the scene was splendid with blue skies and milky white ice in the background. I am yet to find out the science behind the formation of such a rock structure in the middle of an ocean. I decided to spend the night at Blondous in the hopes of catching some Aurora activity but my luck did not favour me. I had a taste of the traditional Icelandic fermented shark and in all honesty, it was yucky. I had to gulp down a strong whiskey straight from the bottle to keep myself from throwing up. I also spent some nice time in the hot pool at the local club. Talk about hospitality ... learn it from Icelanders!